We want to say it, but we just…can’t. Not being verbally expressive can be challenging, especially if you want to show how much you appreciate or love someone. A lot of people would just say that we should just “spit it out”, but they don’t know how difficult it is on our part. We can form the sentences in our brains, we can feel the words working its way towards our mouth, but when we’re about to speak, our voices leave us, and our minds go blank. Setting aside time for someone—no matter how busy you are—is perhaps the most priceless thing you can do for someone. Being there for your elderly loved ones physically and emotionally will not only be good for their health (socializing can greatly uplift a senior’s well-being), the gesture itself sends a message that goes without saying: you care for them and you’re there for them. A lot of the elderly would rather opt not to say what’s bothering them since they don’t want to burden the people taking care of them any further. If you feel like something is off, try to carefully observe your elderly loved one. Broach subjects that you think might be bothering them and gently coax them into telling you what’s on their mind, however don’t pressure them. Just let them know that you’ll be there to listen when they’re ready to talk about it. Older adults have loads of stories to tell, all they need is someone to listen to them. If you really aren’t that close with your elderly loved ones, now’s your chance to know them better. Ask about what they were like when they were kids and compare it to your childhood. Ask them about the things they would change about their life. Don’t forget to keep them up-to-date with what’s going on in your life too! We all went through situations where we felt excluded and we all remember how terrible it felt to be in the outside of the group, looking in. Whenever there’s an event, be it a small get together or a huge family reunion, make sure that your elderly loved ones know about this and accompany them if they’re up for it. Being around people is good for them, especially if said people are close to their hearts. 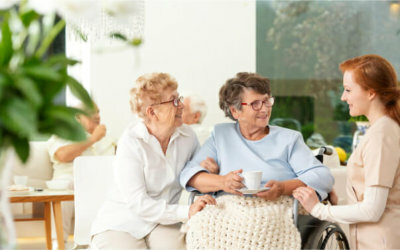 As a provider of Senior Home Care in Vancouver, our team aims to give you excellent non-medical services carried out by our passionate and dedicated care professionals. For more information, call us at 778-859-2695.